HA! – I almost named this design Blue Crocus…but I decided it sounded too much like an 80’s hair band! This past weekend, I traveled to Lemont, IL – home of Inspired Needle owned by another ‘Cathy with a C’! It’s hard to call this work sometimes when I get to hang out with friends…trust me, a lot of prep goes into it, but the payoff of time spent with friends is worth it! I managed to take a few more photos than I usually do (still in search of photo taking interns..) Enjoy the picture trail! So here’s the scoop: I drove from Sioux City to Lemont. Beth from Summer House Stitche Workes flew from PA to Madison where she was teaching earlier in the week. Polly, who lives in Madison, drove Beth to Lemont & took our class. Polly, Beth & I all showed up at Cathy R’s withing 5 minutes of each other and we all went to a yummy, local Mexican restaurant for dinner where the local brew is .. you guessed it.. Pollyanna beer! 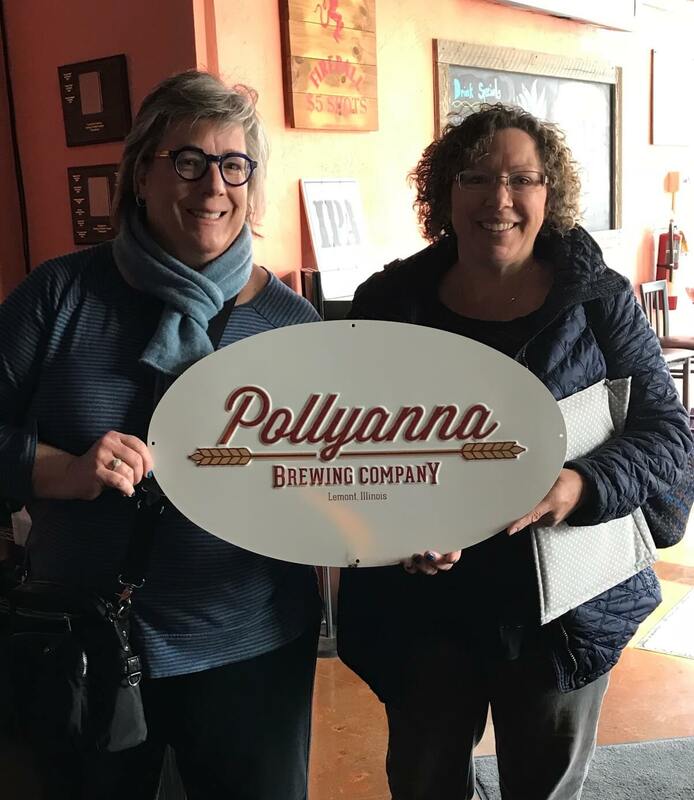 I spied this sign behind the bar and grabbed a pic (cause when your name is Polly, ya gotta pose with the Pollyanna sign😉). BTW: Polly on the left, Cathy R on the right. 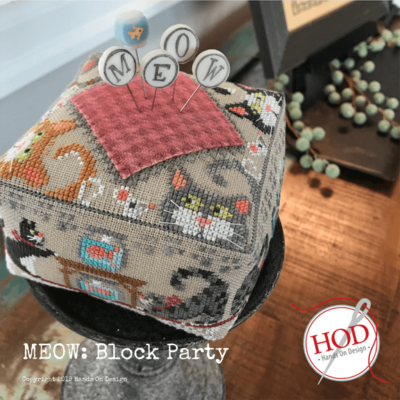 Cathy R held a meet & greet at the shop on Friday evening so students and local stitchers could stop in to enjoy our Trunk Shows and yummy cookies! Guess what else happened at the Meet & Greet?! We had a visit from Priscilla & Chelsea…otherwise known as The Real Housewives of Cross Stitch! 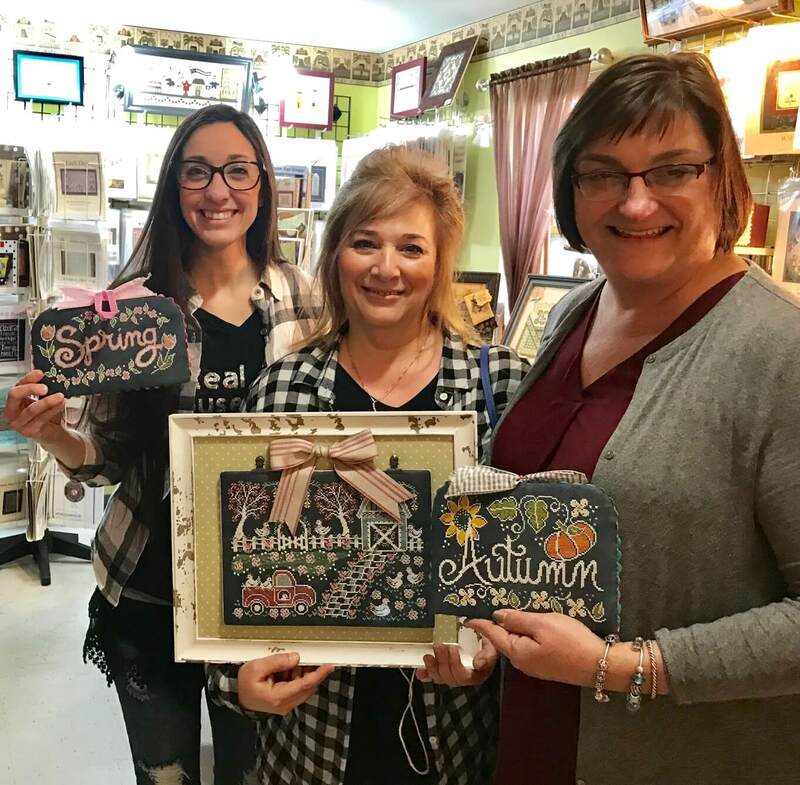 As many of you know, I’ve been collaborating with Priscilla for over 3 years now on our chalk art to chalk cross stitch projects! 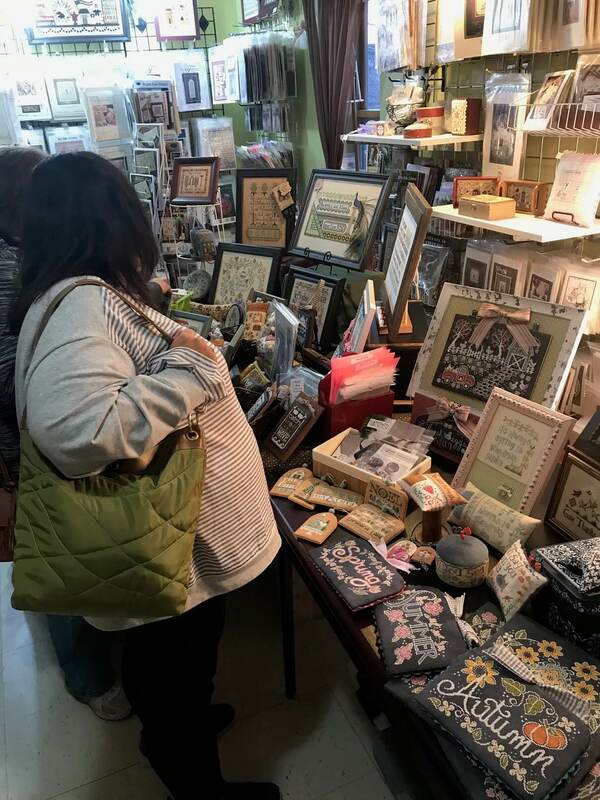 Erin from Myrtle Grace Motifs stopped in Friday night for a surprise visit as well…Erin lives close by and has the most adorable punch needle designs (you must check out her latest with the adorable bicycle in honor of her friend)! No picture 😕 ( this is why I need that intern!) Great to ‘see’ you Erin! Saturday morning was the kick off to our full day of 2 classes. This is the 2nd time Beth & I have collaborated on a teaching piece. We each design our own pieces that conveniently coordinate with the other but also stand alone! 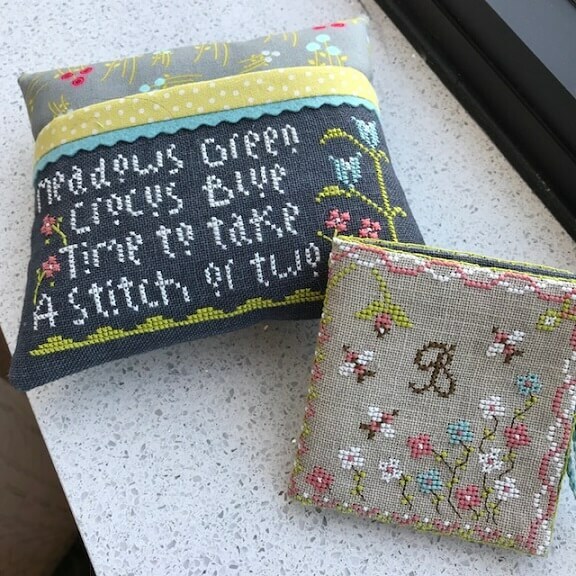 I designed the pocketed pillow & Beth the needlebook that you see above. 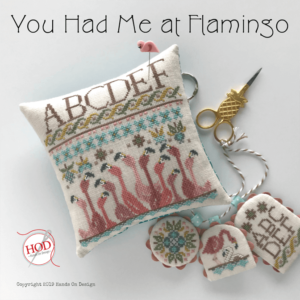 Stitchers were sent kits to pre-stitch while class time focus was on finishing! 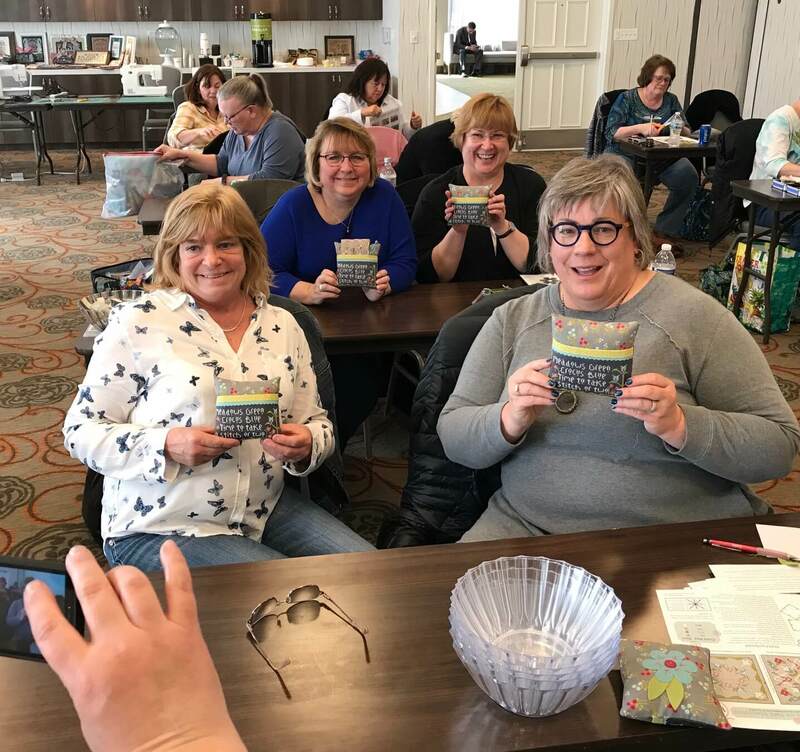 What a terrific group of stitchers…they had fun AND left with a finished project…wait – 2 finished projects! The class photo is a must do moment! Lots of happy smiles! 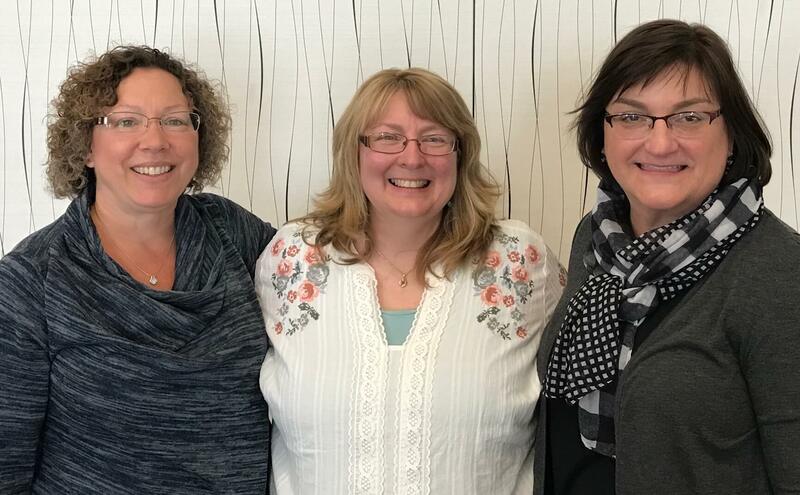 Cathy R, Beth & me! Kuddos to these 2 ladies: Cathy R puts on one heck of a class. A great location, yummy lunch & oh, those class goodies & extras! 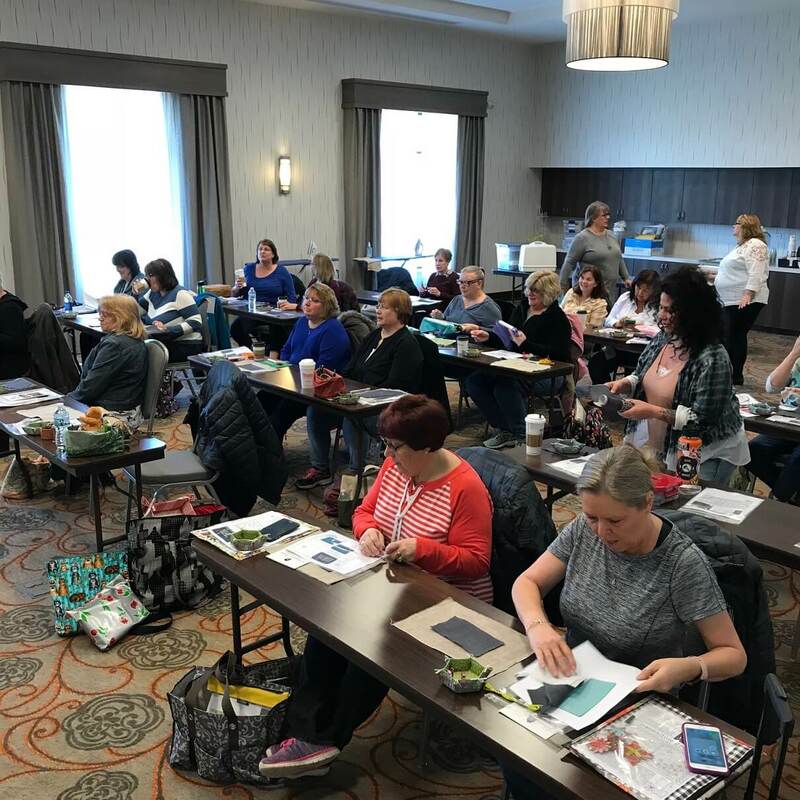 (Cathy R is the force behind Needlework Galleria, a retail shopping event held each fall in St. Charles, MO- think, classes, needlework shopping, meeting designers, stitching time – all in one place). 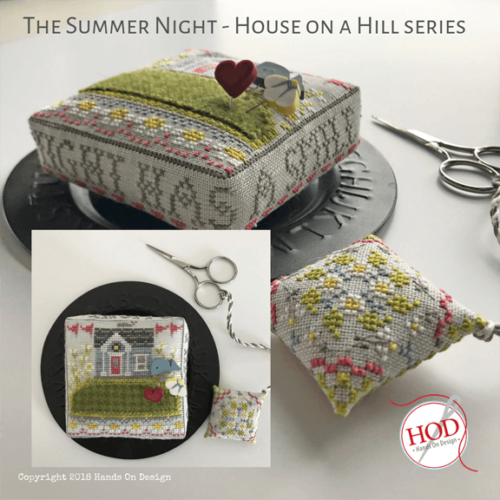 Beth (Summer House) is not only a talented designer & teacher, but a great friend..I highly recommend you take one of her classes if you ever get the chance! Saturday night brought another designer visit..Meg from Lindsey Lane Designs. Meg joined us for dinner and what fun to catch up on what she has been up to – I ‘think’ there is another sampler reproduction in the works..
whew.. I headed for home on Sunday filled with peace of an enjoyable weekend and a great class. 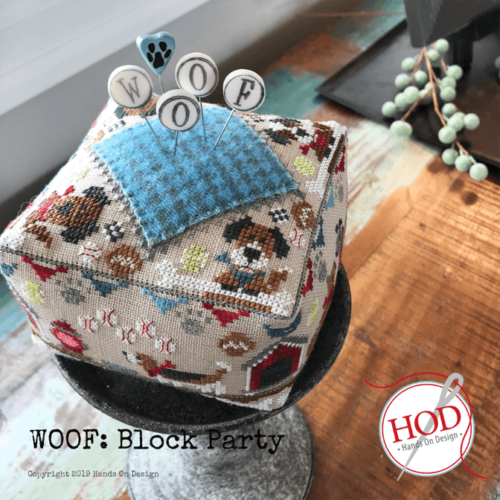 Thanks to FB & IG, the Stitching community is brought together virtually but there is no replacement for actually gathering and sharing our craft. as I turned the final miles towards home, my thoughts changed to what was happening in the coming week..packing the final boxes and moving on..